Bewick's swans out for the count? The UK's biggest ever census of swans is taking place this weekend. 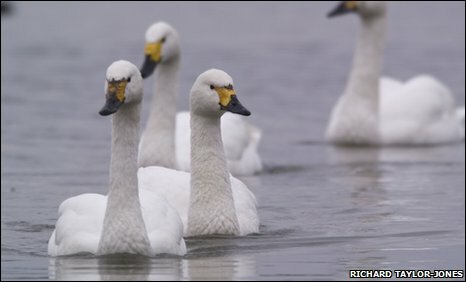 The Wildfowl and Wetlands Trust is getting volunteers across the country to help count visiting Bewick and whooper swans. The information will be pooled with other counts occurring across Europe in an effort to aid international research and conservation efforts. The data is vital after changes to the bird's Arctic breeding grounds and migration routes, researchers say. "Bewick's swans and whooper swans are among Britain's best loved wildlife icons," says swan expert Julia Newth from the Wildfowl and Wetlands Trust (WWT). "The sad fact is that both species are at risk, from threats such as habitat loss, pollution, illegal hunting and climate change," she adds. Bewick's swans (Cygnus columbianus bewikii) are the smallest of three types of swan found in the UK, along with whooper and mute swans, the largest of the three. Whooper swans are amongst the heaviest migratory birds with adult males weighing around 10kg. In autumn, Bewick's swans make the 3,000 km journey to the UK from northern Siberia and the majority of whooper swans come from their breeding grounds in Iceland. The information gathered will inform the work of the WWT and its continental partners to assess how swan populations are faring and set priorities for conservation. 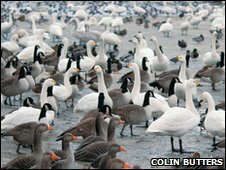 An army of skilled ornithologists and volunteers will be mobilised to count how many swans will be overwintering this year at various locations around the UK. Each volunteer is being asked to take a different site in their neighbourhood and count the number of swans they spot. They will count how many new cygnets are present, family sizes and details of the location including whether the swans are on water or land. "Our counters should find plenty of swans around this weekend. We've had a lot of new arrivals with the first snow," Ms Newth says. Large numbers of swans can be seen across the country at bird reserves such as Slimbridge in Gloucestershire and Welney, in Norfolk. Ms Newth hopes that the census, which is also occurring across many countries in Europe, will provide a better picture of the current state of the birds. "By taking counts in different countries at the same time, we may learn if Britain's gain is somewhere else's loss and get an overall sense of whether populations are rising, falling or stable," she says. "This helps to explain why a multi-national census is so vital." Swan surveys have taken place every five years since 1990 and this one is the largest yet. The last census of swans in the UK was in 2005 and reported 21,000 Bewick's swans and 79,900 whooper swans in northern Europe including the British Isles. Between 1995 and 2005 a decrease of 35% was recorded in the numbers of Bewick's swans and there is evidence that the downward trend is continuing, says the WWT. In contrast, says the WWT, whooper swans are doing well and numbers are improving. The findings of the survey are due to be published this summer.